CU&T train UOI-229 a loaded crude oil train coming into Downtown Easton, PA. lead by SD70ACE 774 in the New Haven heritage and the Lehigh New England heritage unit trailing. CRUDE! 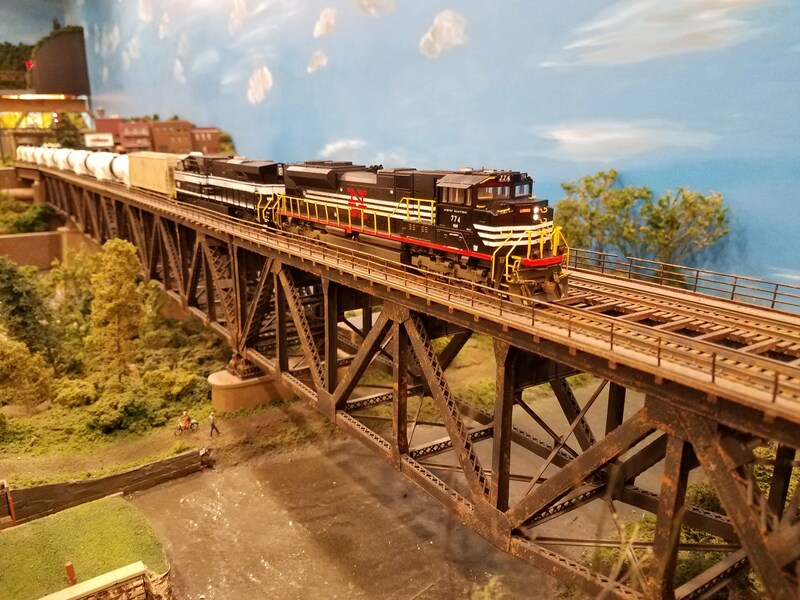 The Cumberland Utica & Toledo Railway April report shows that shipments of Marcellus Region Crude Oil are up for the 18th consecutive month as now 2 companies are in full production. The Standard Oil Co and Marcellus Gas & Oil Co. are now completed phase 1 of their collection and filling stations and are rapidly shipping marcellus crude to refineries in north Jersey. The Bayway Refinery is now exploring options for a second crude unloading rack as their current plant is now overwhelmed with all of the sweet marcellus crude coming east. This is the current schedule of crude trains. Additional trains can be added as service expands. Extra trains will run under the XOI prefix. There are talks underway for unit ethanol coming off of the Midland Southern for refinement at the Bayway, Tremley Point, and Motiva refineries on the Chemical coast. The expected train symbols will use the UET prefix. No further information is available concerning ethanol trains at this time. The Cumberland Utica & Toledo Railway has worked out a preliminary interchange agreement with the Syracuse Binghamton & New York Midland Holding Corp owner of both the Syracuse Binghamton & New York Railway and the Midland Southern Railway to take place at the CU&T Hagerstown Yard in Maryland Interchange of aggregates loaded at various Vulcan Materials Co sites will be handed off to CU&T crews and power swapped to continue the trip north to the Hoffa Cement plant located in Communipaw NJ, and points north of Binghamton NY. CU&T is already hauling aggregate from the Greenwood Mining and Materials Corp along with the Hewitt Hasenclever Mining Co out of various northern jersey facilities. The agreement is that SBNY trains will interchange their MS traffic at Binghamton and travel CU&T under symbol BHMS. MS trains will interchange their traffic at Hagerstown and travel via symbol HGSB. In addition the loaded aggregate trains from MS will travel Hagerstown to Communipaw twice weekly under symbol UMA-300/301.MS will operate aggregate trains to SBNY via CU&T for interchange at Binghamton NY under symbol UMA-350/351. CU&T, MS, and SBNY are excited to be able to provide the north east with seamless customer focused service. CU&T is excited to announce shipments of Marcellus Region Crude are up 4.2% as the Marcellus Gas and Oil Co have expanded drilling in the region. Shipments of frac sand have nearly quadrupled causing a shortage of cars. In return the CU&T has purchased a large lot of trinity built 3281 covered hoppers to accommodate the surge in traffic. These cars are dual service capable and can be used in cement service if needed.